Dealing with something like Bipolar is a constant struggle. In She Could Fly: The Lost Pilot #1, that struggle is exacerbated by plenty of other trauma as well. The issue is written by Christopher Cantwell, illustrated by Martin Morazzo, colored by Miroslav Mrva and lettered by Clem Robins. Luna has crash-landed back into her life after spending a year in a mental institution...but that might just mean she's closer to the edge than she's ever been before. After discovering clues about the Flying Woman's missing family, Luna's obsession reignites, threatening to again unravel her fragile mind. Meanwhile, a mysterious guru appears in the sewers of Chicago and a Russian mercenary seeks old secret technology, and the specter of violence begins to loom over everyone once more. Luna begins to wonder...will she even survive long enough to go insane? Sating Cantwell's script in She Could Fly: The Lost Pilot #1 is complicated would be a great understatement; it's extremely complex and intricately woven. Luna continues to be the focal point for the entirety of the narrative, as everything (and everyone) is positioned in reaction to her and in seeing her reaction to them. Each character is affected by the previous events in different ways, but Cantwell writes Luna in particular as having difficulties coming to grips with reality on more than one occasion. Cantwell doesn't lose sight of the book's title though, with a recurring thread running where many of the characters in the issue are still obsessed with the concept of flight and its ramifications; in fact, Luna is still obsessed with it while a new group is hellbent on understanding how it works as well. Cantwell crams so much into the issue that the reader can easily get whiplash moving from one scene to the next, but it's also clear that there's a grander scheme that's going to unfold. Morazzo returns to the new series on art duties, providing a seemingly disjointed style that's an appropriate visualization of what Luna must be feeling on a near-constant basis. The wispy linework is extremely effective in portraying Luna and the supporting characters in a way that feels delicate, as if to reinforce the notion that the psyches of everyone involved is fragile. Morazzo's pages ebb and flow in terms of panel presentation, yet he doesn't deviate from clean squares that refute insets and overlays. There are some instances where things get a little graphic, but Morazzo doesn't allow the violence to be too gory and it's just emphatic enough to have the desired impact. Mrva's colors add a certain refinement to the artwork. 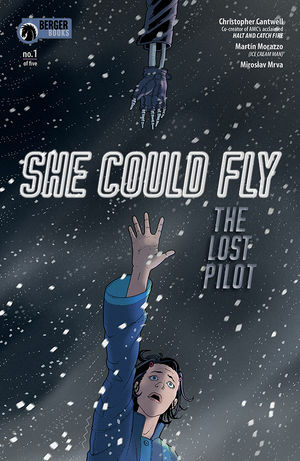 She Could Fly: The Lost Pilot #1 is a lot to take in and there's a lot going on. Luna is fighting battles with herself, in terms of attempting to understand who she's becoming and how to handle the events she's witnessed and been a part of. Cantwell's script is jam-packed with story threads to pull on, all of which will likely be intertwined at multiple points. Morazzo's artwork is a great fit for the book tonally as it seems to underscore a somewhat disjointed attitude. She Could Fly: The Lost Pilot #1 has plenty of appeal to fans of the previous series, but there's enough solid craftsmanship that new fans will appreciate as well. She Could Fly: The Lost Pilot #1 is available April 10.